Rob Cesternino and Akiva Wienerkur skipped out on the Jujyfruits (not kosher and also gross), but might just start their podcast about podcasts when they finish recapping the latest episode of Seinfeld. This week, they break down “The Opposite”, which first aired May 19, 1994 as the finale of season five, and was written by Jerry, Larry and Andy Cowen. The news was slim this week. Akiva shared a top ten podcast list that ranked their Seinfeld podcast number one. It happened to be on his own podcast 32 Fans in 32 Days that he does with Chester. George once again has the richest storyline in this episode. He starts off lamenting how his life turned out, only to decide at the diner to do everything the opposite of his instincts, since they are always wrong. Once he starts this, everything starts going his way. He catches the eye of an attractive woman, who not only wants to date despite him admitting he’s jobless and living with his parents, she lines him up with a job at the New York Yankees as the Assistant to the Traveling Secretary. This is the first appearance of Larry David’s voice as George Steinbrenner. Jerry has very little to do in “The Opposite”, besides discovering that he always tends to break even in life. When Elaine throws a 20 dollar bill out the window, Jerry soon after discovers a 20 in his coat pocket. While at dinner with Rachael, she breaks up with him, and he’s so convinced things will even out, he isn’t even upset. 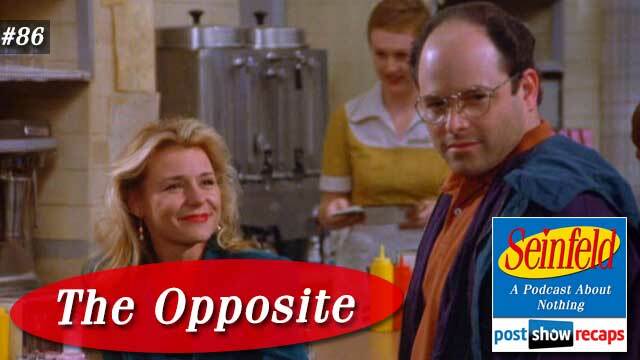 The idea culminated when he realized how Elaine and George have swapped lots in life; one is up while the other is down. Elaine starts the episode celebrating Pendant Publishing getting bought out in a big merger, and on the heels of deciding to move in with Jake Jarmel. Things starts to spiral downward when Mr. Lippman inadvertently kills the merger at Pendant by appearing rude by not shaking hands while he’s sick. She then learns that she’s being kicked out of her apartment for a variety of reasons, then hits bottom when Jake dumps her for getting Jujyfruits at the movies right after hearing that he was hit by a car and in the hospital. Kramer’s coffee table book is finally a go, and he will get to go on Regis and Kathy Lee to promote it. When he goes “bonkos” on Regis and the interview goes sour, Lippman tells him to not do any more press. Kramer is crestfallen because he was dreaming to go on Sonja Live. Rob and Akiva had several great tangents this week. First they talked about how the actress who plays Victoria is Dedee Pfeiffer, sister of the star Michelle. Akiva once again shunned Star Wars, preferring to watch the new Chipmunks movie. They discovered that 411 was actually in existence dating back to the 1930s in New York City, and that 311 the band was not named for the KKK as rumored. Akiva shared how his cousin works for Facebook, and his mother wanted to thank Mark Zuckerberg. In discussing what would be different in 2016, Rob thought Jerry talking about the wardrobe benefits of being gay included a line about “recruiting” someone new wouldn’t be politically correct. The guys continued to grade each of the gang’s storyline. George was an iconic part of the plot, so they gave him an A. Elaine’s fall from grace was well received by both, but Akiva gave her an A, while Rob gave her a B. Kramer got an A from both despite not having a big part of the plot. They both agreed that Jerry had little to do with the episode, but was enjoyable. Akiva gave him a B+ and Rob gave him a B-. Akiva ranked the episode in the top 9, adding that it is not number one. There were a bunch of emails this week. Johnny De Silveira asked if either of the guys tried behaving the opposite to impress a girl. Akiva hadn’t, but Rob tries doing the opposite of his instincts with Nicole from time to time. He also asked if Kathy Lee had an issue in real life with being kissed by Kramer like that. The guys hadn’t heard there was a problem. Dan the donator wanted to know if Jason Alexander won the Emmy, but Rob confirmed that Michael Richards actually did that year. Dan also noted that by doing the extra long podcasts, the guys have raised $206 for Baby Buggy, a charity run by Jerry Seinfeld’s wife. Eddie Mack wondered if the real Steinbrenner would have been a continuing character if he played himself. Craig asked why George didn’t stick with the opposite since things worked out so well. The guys didn’t have an answer, but Rob often wondered that himself. Harry noted that he loved following them go through season five. He asked why Kramer wore a puffy scarf but not a puffy shirt. Also, he questioned why Elaine would pay the outrageous price for Jujyfruits at the theater. Lastly he wanted to offer his services as their fake movie correspondent. Liz wanted to thank Akiva for the Making a Murder recommendation, and comment how great this episode was. Amir said “The Opposite” is his favorite episode of all time. He questioned what kind of promotion was Elaine up for that she was so happy for the merger. He also noted that George wore a windbreaker to the Yankees job interview, and how the idea of even Steven is a great correlation to the philosophy of the show. Lastly, Chester wondered if anyone still uses a handkerchief, and if you could really leave a message with a movie theater employee. He was upset that the $20 in the pocket counts as evening up, since it was his 20 in his jacket. He also wondered why Lippman’s office is different every time they show it. Lastly, he thought the episode was ranked too high, disagreeing with Akiva and Rob. Tune in next week as the guys will recap “The Chaperone”, jumping right into season six with no delay. Send in your questions by emailing [email protected]ps.com. Don’t forget to subscribe to the podcast by going to postshowrecaps.com/ seinfeldITunes where you can rate and review the podcast. You can get a discussion going about the podcast by leaving a comment on the show page, and as always, you can follow them on Twitter @robcesternino and @keev26.